Home » What Equipment Is In the BarBend Gym? This list includes some of the strength training equipment that is included in the BarBend office gym! In case you didn’t notice, we film a lot of videos here at BarBend spanning from reviews to educational content. Over the last year, we’ve spent a considerable amount of time connecting and working with a bunch of difference companies to build out our in-office gym. We tried to equip the BarBend office with a variety of equipment from multiple companies that we — and many others — would consider essential for a home gym. Since we film so often in our in-office gym/studio and the equipment is constantly in the background or being used in our videos, we wanted to take a second and disclose what exactly is in our gym. It’s important to note that many pieces of equipment have been provided to us for use from various companies. Below, we’ve included highlights of the equipment that makes up the BarBend in-office gym. 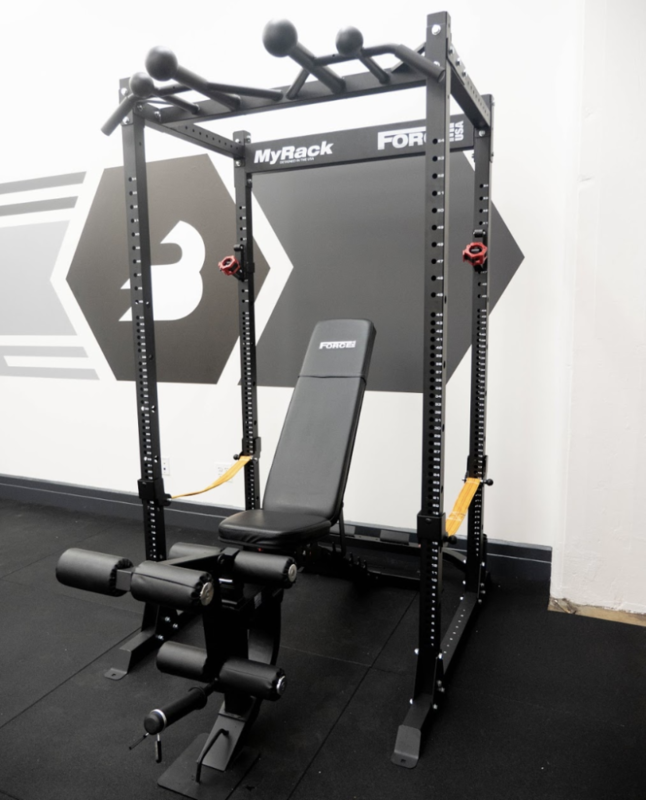 A focal point of the BarBend gym is the Force USA MyRack. This massive squat rack was sent to us from Force USA and it came with all of the attachment options. This power rack has a base price of $399.99. After you cover your bases, you have the option to customize the rack in multiple ways and add attachments like monolifts, safeties, and much more. 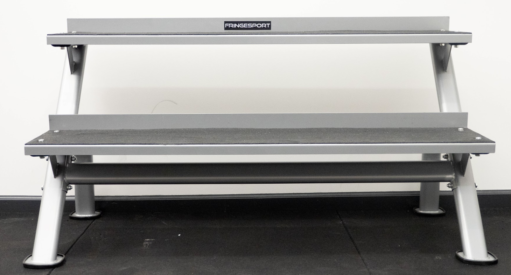 Check out some of the specs for the Force USA MyRack below! The Force USA MyBench comes with flat, incline, and decline settings, and also offers preacher curl and leg extension attachments. 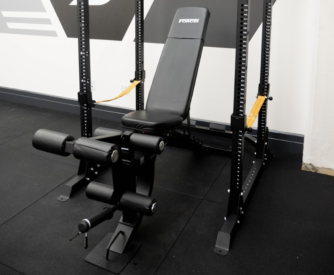 On top of the MyRack, Force USA also sent us the Force USA MyBench, which is one of their most dynamic bench options. This bench allows for a flat, incline, and decline setting, along with a preacher curl and leg extension/curl attachment. If you’re in need of a bench that will match a variety of needs, then this could be a good option for you! Versatile bench for incline, flat, decline pressing with testing up to 750 lbs. Attachments: Leg extension/curl and preacher curl. Lifetime structural warranty for manufacturer’s defects and design issues. A powder coated kettlebell that is designed for versatile work outs and comes with a lifetime warranty. 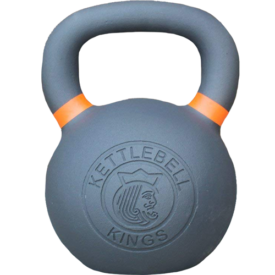 The kettlebells that our gym is equipped with are from Kettlebell Kings. In our gym, we have seven Kettlebell Kings Powder Coated Kettlebells and one Kettlebell Kings Steel Standard Kettlebell. 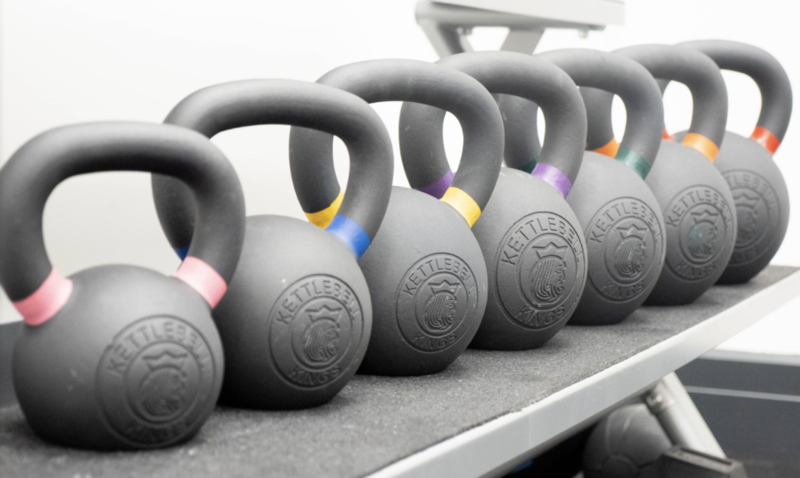 Of all the kettlebells we’ve reviewed, Kettlebell Kings were one of our favorites for their high-quality kettlebells and lifetime warranty. Check out which categories Kettlebell Kings’ Kettlebells won in our Best Kettlebell Round-Up! Strong, durable, and grip facilitating powder coating, and smooth steel on the steel standard. Flat bottom finish and colored rings to identify poundage. Steel standard kettlebell utilizes similar dimensions to competition kettlebells. Kettlebell Kings Kettlebells offers lifetime warranties for these bells. Need new bells? Check out Kettlebell Kings and save 10% when you use the code “barbend” at checkout. The Rep Fitness Bumper Plates have been tested to withstand 12,000 drops from a height of eight feet, and are designed to have a low bounce. The bumper plates that our gym is equipped with come from Rep Fitness. We have a total of ten plates, which include: two 55 lb, 45 lb, 35 lb, 25 lb, and 10 lb colored bumper plates from Rep Fitness. 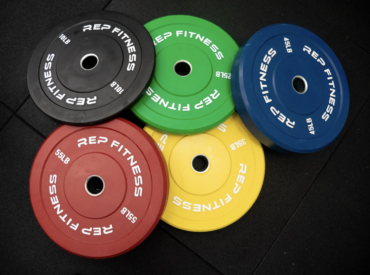 If you’re interested in colored plates or simple black plates, Rep Fitness offers pretty comparable prices to other top brands on the market. These plates have been tested to withstand 12,000 drops from a height of eight feet, so needless to say, they’re designed to last. Durability tested to withstand over 12,000 drops from eight feet high. Steel inserts with hooks to ensure long-term durability for plate-to-sleeve contact. Rep Fitness’ rubber offers a low and minimal bounce when dropped. Learn more about the Rep Fitness Bumper Plates. In our gym, we have two barbells. 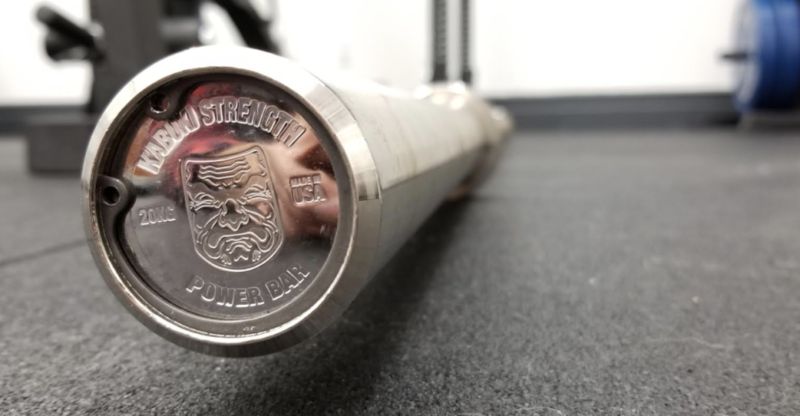 The barbell that we use for powerlifting and other heavy movements comes from Kabuki Strength, and it’s the Kabuki Strength New Generation Power Bar. The New Generation Power Bar offers an incredibly high tensile strength of 250k and aggressive knurling. Tensile strength of 250k and rockwell hardening for long-term outer construction. Aggressive knurling and center knurling to maintain placement on back in squats. Made with IPF and IPL requirements in mind, so it’s a great training bar to have competition carryover. Warranty: Five year warranty for manufacturer’s defects/design issues. 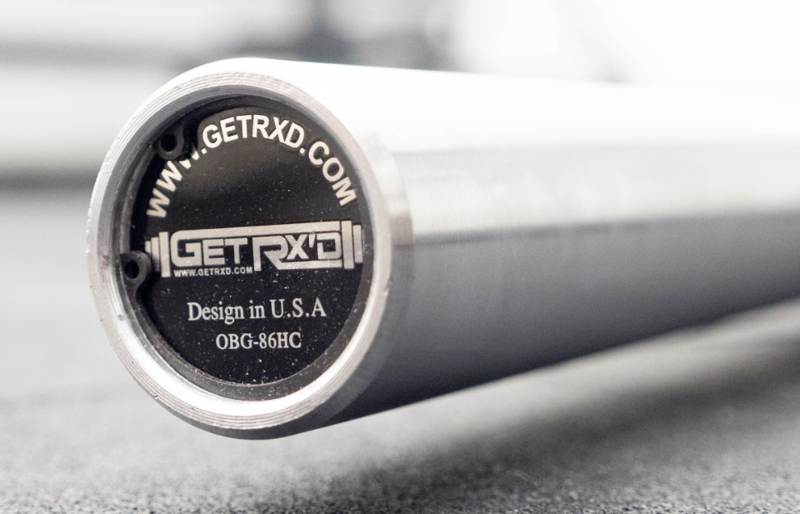 The Get Rx'd WOD Bar 5.0 offers a strong tensile strength of 190k and has a lifetime structural warranty. 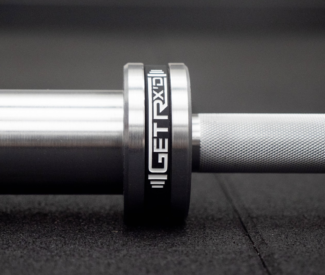 The second barbell that we use in our gym is the Get RX’d WOD Bar 5.0. This barbell offers a lot of solid construction features and we find its best for more dynamic workout movements such as cleans, snatches, and presses. The WOD Bar 5.0 offers a strong 190k tensile strength and lifetime structural warranty. Tensile strength of 190k and zinc coating to support outer construction. Two over-sized needle bearings and bushings to promote a smooth, consistent spin. Lifetime structural warranty and one-year bending warranty. Learn more about the Get Rx’d WOD Bar 5.0. 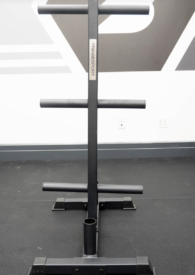 The Fringe Sport Vertical Plate Holder has six 8" holes and has the capability of holding up to 600 lbs of metal or bumper plates, and has two barbell holders. The plate holder in our gym was provided to us from Fringe Sport. This plate holder has six 8″ pegs that run up each side and has two barbell holders. Additionally, this plate holder has the ability to hold up to 600 lbs and comes with a one-year structural warranty. Six 8″ inch plate holding arms and two barbell holders in the bar. Weight capacity of 600 lbs and a total weight of 30 lbs, so it’s easy to move when unloaded. Solid one-year warranty for manufacturer’s defects. 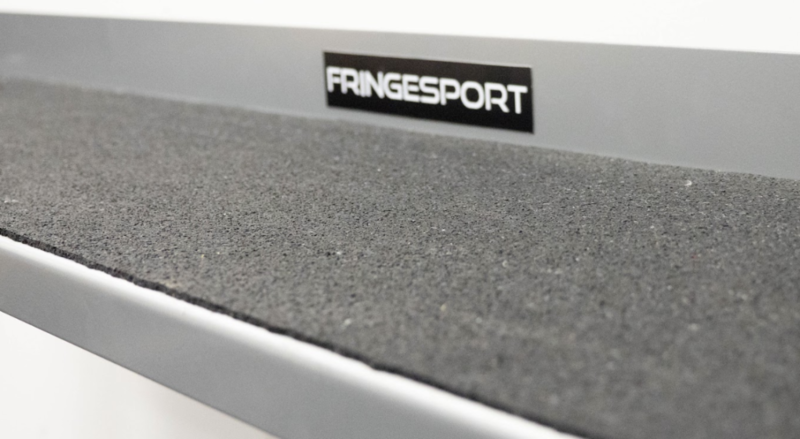 Learn more about the Fringe Sport Vertical Plate and Bumper Holder. The Fringe Sport 2-Tier Kettlebell Rack offers a one-year structural warranty, rubber padding on each level, and 12-gauge steel frame. 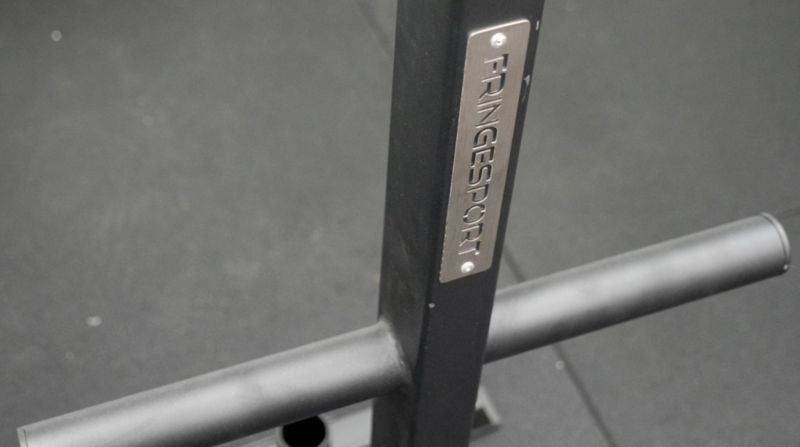 The rack we set our lineup of kettlebells and dumbbells on also comes from Fringe Sport. This rack comes with two levels and can easily holds eight kettlebells or six dumbbells across (varying in weight). We like this rack because each level offers a thin layer of rubber padding, so there’s never any metal clanking when putting equipment back. Twelve gauge steel frame that has a total weight of 98 lbs. Each rack is lined with a rubber padding to protect the rack, your equipment, and limit clanking. Easy installation and one year structural warranty. Learn more about the Fringe Sport 2-Tier Kettlebell Rack. As we continue to build out our in-office gym and beef up our video sets, we’ll continue to try and bring in more forms of equipment. If you’re ever in question of something in our gym, always check this page!